“Well” to quote Shirley Valentine, “I won a competition, you see”... A writing competition for Bollinger’s Life Can Be Perfect competition to describe in a short amount of words a perfect moment in time. I went back to my former life in Paris, but just transposed the beaker of cheap Rhône with a glass of champagne. 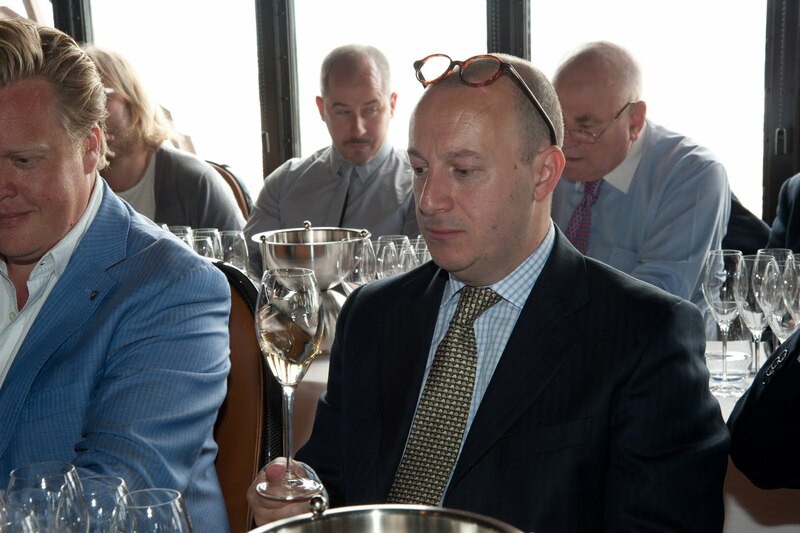 So I am, seated amongst the most notable wine experts, journalists and television presenters of the world feeling a little out of my depth even with my own wine qualification and getting a little star struck too (two hours sitting next to the entertainingly brilliant Olly Smith, for example). The prize? To be taken to Paris, stay in a boutique hotel, be whisked off the next day by chauffeur driven limousine to the Jules Verne, an Alain Ducasse restaurant on the first floor of the Eiffel Tower, to taste half a century of Bollinger RD (Récemment Dégorgé) going back to 1952. Twelve bottles; twelve tastings, all presented by Bollinger’s cellar master, Mathieu Kauffmann. Can you imagine? No. Neither can I. That is why I am still pinching myself a week later. Récemment Dégorgé comes from an idea conceived by Lily Bollinger, in layman’s terms means some of the vintages were held back from release to mature for longer on their lees, usually a minimum of 10 years (all our wines were disgorged on 7th March with the exception of the 1952 in 1969). The champagnes will have a greater chance to develop unique characteristics of aroma and taste from this ageing. This is enhanced by the fact that the fermentation process is in oak barrels, giving more nutty, woody and smoky smells, but also bottle aged with corks rather than crown caps for longevity. Truffle smells (’66) and mushroom (‘88) , smoke (’97)and toast (’76), brioche and nuts (’59), coffee (’85), leather... (leather? That was the smell from the leather coated pens they provided, which stuck to my finger... didn’t I feel foolish)... stewed fruits (’66) and vegetal elements (‘79) such as asparagus, and of course, lemon and lemon pith. These were the aromas coming out of a lot of the various vintages as we went through the ages. On the palate an array of flavours: gooseberries (’97) and lemon sherbet prickle (’88), apples (’95) and light tannic wood (’79), caramelised fruits (’76) and honeys (’66), snow peas (’59), steel and flint (’96); flavours mingling on the palate from the initial smack or caress, depending on the wine, to the long, slow acidity that keeps the mouth watering long after the last sip. So, the outstanding ones? For me, the 1961 and the 1952 vintages. Both years were hugely different in taste and texture but both amazing: one for quality and one for emotive reasons. As the vintages got older so the colours got richer. The 1961 had a rich golden yellow colour and light petillance in the glass. On the nose, there were very light creamy notes and lemon, alongside hints of mushroom and smoke. This promised to be a dry glass, especially after they honey hit of the 1966. A second nose dive into the glass brought the mellower fruits to the fore. On the palate, the taste promised what the nose had suggested. Sharp lemon high notes with hints of flint and wood, smooth and rich, though much more tempered than later years, and rounded, but not necessarily creamier (these are extra brut wines with an average sugar level below 4g per litre), with a good length of acidity. This was a perfect balance, challenging the taste buds to discover another flavour on each and every sip. If these wines were paintings, perhaps the 1961 could be a cubist painting; a Picasso, challenging to the senses, each angle a twist. And yet, take it all in and the picture is one of marvel and brilliance. The 1952, in that context has to be La Giconda, the Mona Lisa. Why? Very simply put, the painting is not da Vinci’s greatest work (opinion is divided as to whether he squandered his talents on science instead of art for example. But I digress). And yet... and yet with that comes a sense of awe; a sense of respect; a nod to its age. And this is where the 1952 comes into the spectrum. The colour of this wine is so rich it is golden, not yellow gold but a darker hue, almost like it should be an Alsace wine were it not for the bubbles in the glass (I know there is Cremant d’Alsace but humour me!) Pure toast and smoke, hit the nose as well as the richer smell of black coffee and spice. Another smell and there are hints of zingy herbs, complementing the spice, almost edging toward mint. This wine is much smoother on the palate, with some natural maderisation , sweeter to the tongue and more unctuous. Lemon fruits meet wood and cream, but maybe candied lemon; sharp but slightly honeyed. Sublime in so many ways, and a privilege to be one of the few people in the world to have tasted it. However, that was the last wine we tasted and by the end my taste buds had gone into paralysis and I had “leather tongue”. It was time to have lunch and drink lots of water. Life can be perfect? It surely can.